Not long after I graduated from college, I began to wonder how music was made in places outside the US. I'd learned so much about Europe and the US (in one way), but what about other places in the world? I was also beginning to feel like I wanted further education that would somehow combine my BAs in Music and Religious Studies while also giving me good reason to travel. So, I found this thing called Ethnodoxology, and an MA/certificate program at Bethel University (now at Liberty University) via the internet. I enrolled for the MA, and thought that even if I didn't like it and didn't want to pursue it further, downgrading to a certificate was possible, and didn't waste too much in time and resources. The more I learned, the more I enjoyed, and now, eleven years in, it's amazing to think back to where God has taken me. 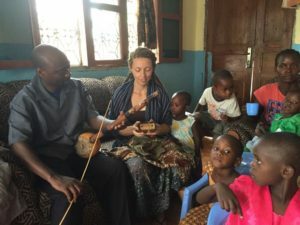 In recent history, hearing how Taturu people on the western side of the Serengeti in Tanzania are believing in Jesus because they are hearing about Him in the Taturu language and through Taturu song and dance. I, and the other members of the Heart Sounds International team that led a seminar in Taturuland in July 2014 were only part of what God is continuing to do in the people of that place. What do you hope will be different in 25 years because of your work with Ethnodoxology? If God keeps me going in the same way I'm going, I hope that in 25 years Tanzanians will know that they don't need to leave any part of who God's made them to be at the door when they enter The Church. I am praying that in 25 years, Christians in Tanzania will have learned something about how to celebrate and honor the depth of diversity present in this country while remaining unified not only as Tanzanians, but even more so as Christians.